Lookout surfing world, a new breed of furry surfers are ready to steal the show as part of the VetShopAustralia.com.au Surf Dog Spectacular which will take place on March 11, 2012 at 4:30pm as a main attraction of the opening ceremony at the annual Noosa Festival of Surfing. The VetShopAustralia.com.au Surfing Dog Spectacular, sponsored by Bayer, is tipped to be a favourite event this year for the spectators at the Noosa Festival of Surfing and is also set to make history, being the first ever official surfing dog event to be held in Australia. After having watched the surfing dog craze take off in the US with an annual contest now held every year in California, we thought it was about time the Aussie dogs had a chance to hit the water and show everyone what they have got. Headlining the Surfing dog event will be former world tandem surfing champion and professional dog trainer Chris De Aboitiz who has been riding waves with his super surf dog Lani for years. Chris has also taught many other surfing dogs how to ride a wave, with a selection of them also set to show off their doggy surfing skills at the event. Since the early beach boys started taking their dogs out in the surf with them at famous surf break, Waikiki more than 90 years ago, the sport has made stars out of some of them and can today be seen internationally as a sport some owners get very serious about. The VetShopAustralia.com.au Dog Surf Spectacular will be an exhibition only event this year and strictly for fun, so if your in the area or live close by, come on down to see some super surf dogs carving up the waves! Join our VetShopAustralia.com.au Facebook Page for event updates. wow, this is gunna be great. wouldnt it be cool if we had a surfing dog superstar like tillman the bulldog surfing at this event? I hope we do! Go all you Aussie surfing dogs, get out there and give it a try! 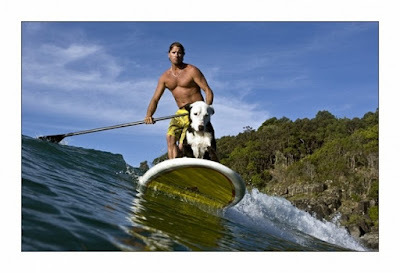 i luuuuuuuuuuuuuuuvvvvvvvvvvvvvvv surfing dogs! I will be there 4 sure. I cant wait for the Surfing Dogs Spectacular. Woof Woof.